Ahmed tells us his story in his own voice, beginning with almost flunking out of Trinity College in the '90s. But thanks to some caring teachers and a lot of hard work and passion, he not only graduated, but found his voice as a writer. While struggling to buy food, do his school work, and make peace with his roommate, Ahmed is also dealing with troubles back home in Somalia, including phone calls from his brother about their ailing mother, and news of his general cousin's injuries. But Ahmed stays focused, finally accomplishing his goal and eventually making his way to Minnesota. The play is constructed in an interesting and innovative way, using narration, stories from Ahmed's mother, visits from Maya Angelou and Malcolm X, and Ahmed's constant companions Owl and Camel, his imaginary fiends, like the talking animals found in Disney. It maybe sounds silly, but it's really quite a charming and clever way to let us witness Ahmed's inner dialogue. In the reading last year, there was talk of puppetry, but somewhere along the way the choice was made to use live actors instead. 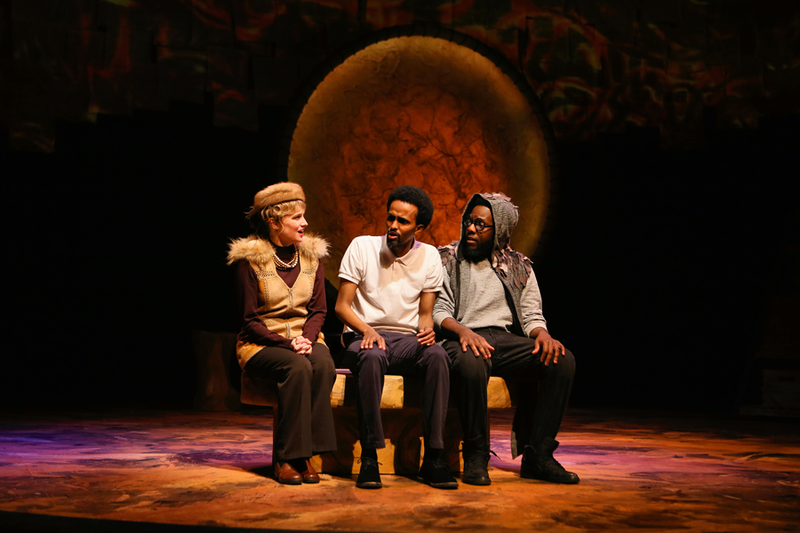 Which turns out to be an excellent choice, especially when those actors are Mikell Sapp (Owl) and Tracey Maloney (Camel), who bring such personality, playfulness, and spirit to their roles. Clothed in costumes that just hint at the animal (designed by Aaron Chvatal), and with just a nod or two to their non-humanness (Mikell does the cutest trilling "who" sound), Camel and Owl are the best companions a person could have. Director Faye M. Price keeps all of these ways of storytelling flowing smoothly, in a way that's never confusing or feels out of place. M. Hajji Ahmed, himself an immigrant who's only been in the country for three years, gives such an open, heartfelt, and natural performance as Ahmed that the people behind me thought he actually was the Ahmed character. The play really hinges on the audience connecting with Ahmed, and Hajji makes him so charming and likeable, that it's easy to do. The excellent ensemble cast also includes Ashawnti Sakina Ford as Ahmed's mother and Maya Angelou, JuCoby Johnson as Ahmed's brother and Malcolm X, Rex Isom Jr. as multiple characters real and imagined, and Rich Remedios as the warm and rumpled professor. 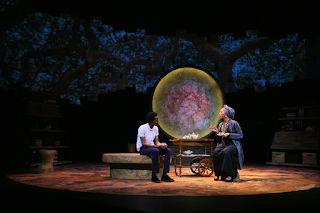 Joel Sass has created a beautiful set on which the lighting (designed by Michael Wangen) and videos (designed by Kathy Maxwell) play out, providing a warm atmosphere for the story. What looks like a large round drum, that at times represents the sun or the moon, dominates the stage, with a streak of white fabric squares above it, provide the backdrop for videos of Ahmed's homeland. The stage is populated with a few natural looking shelves and stools that blend the outdoors with the college setting. 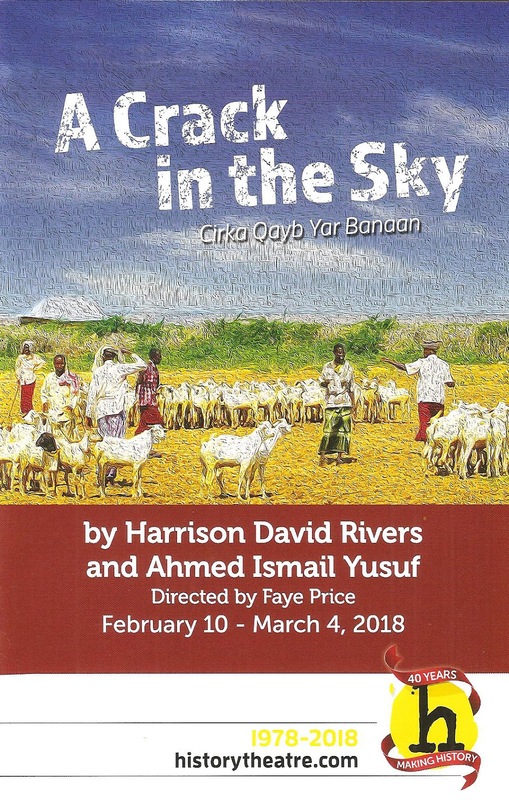 A Crack in the Sky is a charming new play, with disarming performances that will put you inside the immigrant experience without even realizing it. This is a play that's easy to watch, that brings joy, and hopefully also brings understanding of people with experiences different from our own. Continuing through March 4. *Harrison David Rivers is the hot new playwright in #TCTheater this year. This is the first full production of a play he's written that I've seen, but not the last. He wrote the book for the new musical Five Points, premiering at Theater Latte Da this spring, and his play This Bitter Earth will be produced at Penumbra Theatre, also this spring. And if you need more Harrison David Rivers, you can attend a free reading of his new play the bandaged place at the Playwrights' Center in April.